Other Products by Jym Supplement Science. Search other Post-Workout Recovery products. 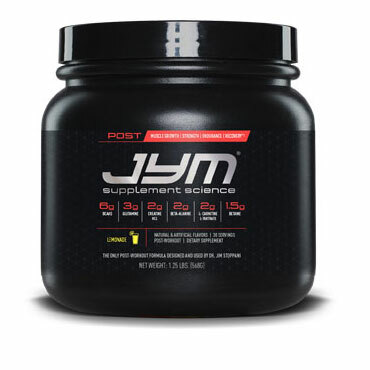 Jym Supplement Science Post Workout is a comprehensive post-workout supplement designed by Jim Stoppani PhD. Jim was a research fellow at Yale University’s School of Medicine so understands how the many hours he puts in at the gym effects the muscles on an intricate level within. Jim spent years of research on creating his very own post-workout that provides nutrients at doses that work to effectively support the muscles in recovery and thus growth. Jym Post utilises the same 5 ingredients contained in Jym Pre which should be taken both before and after every training session to support muscle performance and protein synthesis to initiate growth, along with L-Carnitine and anti-catabolic L-Glutamine. So lets take a closer look at Jym Supplement Science Post Workout. Firstly Post Jym contains 3g per serve of L-Glutamine which as stated above is anti-catabolic, meaning it has a sparing effect on muscle tissue and helps prevent muscle tissue catabolism (muscle breakdown). Physical stress, such as intense training can deplete your stores of glutamine from areas of the body such as the gut and immune system to feed the muscle tissue where it is most abundant. Glutamine is essential to keep you training, recovering and building muscle. Next Jym Post delivers 3g OF Creatine HCl thought to have higher solubility which increases the absorption and effectiveness of your creatine. Creatine is one the highest researched ingredients in the supplement industry which has been proven to increase both strength and power. Backed by clinical research post-workout ingestion of creatine is its ideal time so its addition in Jym Supplement Science Post is a given. Not only great for performance BCAA’s are essential to recovery as they flick the switch that initiates protein synthesis. Jym Post has a huge 6g per serve at a 3:1:1 ratio Leucine: Isoleucine: Valine. The extra Leucine in post Jym offers a great benefit as this is the BCAA depleted most during training and is the one responsible for stimulating mTOR. Beta-Alanine at 2g per serve is great for slowing onset to fatigue by inhibiting the build-up of lactic acid which has positive effect on muscle endurance and recovery. 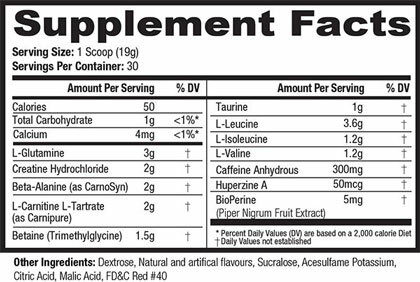 Jym Supplement Science Post also delivers 2g of L-Carnitine L-Tartrate per serve which has a good case for its inclusion in Jym Post. Firstly carnitine l-tartrate has been shown to improve muscle recovery post-exercise due to it up-regulation of nitric oxide which dilates blood vessels and improves nutrient delivery to the muscles. What is really cool about this nutrient is its ability to enhance testosterone receptor activity to promote anabolism. Trimethylglycine or Betaine is delivered at 1.5g and not only improves performance but plays a role in protein synthesis to support muscle growth. The above ingredients in Jym Supplement Science Post Workout have been chosen for their researched an proven benefits, but more importantly for their ability to work in synergy with each other making each ingredient more effective than when taken individually. If you truly want to optimise your recovery to build more muscle look no further than Jym Post! As a dietary supplement mix 1 scoop of Post Jym into 475 - 945ml of cold water within 30 minutes post workout. Consider letting the Jym Post Workout mix sit for 10 - 15 minutes before consuming. Also it may be better to drink it over the course of 15 - 30 minutes. You can stack it with Jym Post Workout Carbs for optimal results.